The bright and enticing cover of Parmesan, The Reluctant Racehorse promises a humorous, rollicking tale and this book fulfils its promise. Jacqui Halpin’s story opens with Parmesan, a sleek, brown horse, born of champion racehorse parents, proudly resting in the farmyard stable surrounded by puppies. We quickly learn that Parmesan absolutely and completely believes he is a dog. 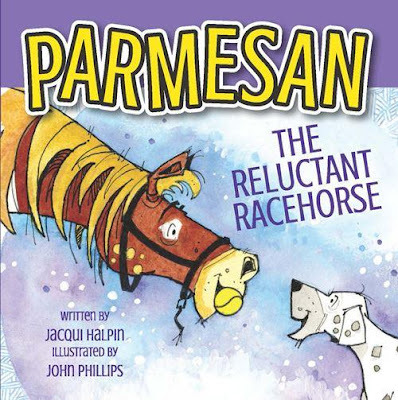 John Phillips’ illustrations throughout the book create a playful, energetic representation of life on the farm where Parmesan lives, while the end pages transport readers to the horse racing track. Parmesan is lovingly cared for by his trainer, Joe, who recognises that Parmesan identifies as a dog and accepts Parmesan as he is, often playing fetch with him. However, Parmesan is blissfully unaware of his owner’s expectations for the upcoming Spring Racing Carnival. If Parmesan does not race, he will be sent away. Joe tries every way he can to ensure that Parmesan will be able to stay where he loves and is loved. Parmesan, The Reluctant Racehorse is a fun and light-hearted story with a deeper layer of understanding, acceptance and remaining true to oneself.